A Rhagoletis pomonella fly explores the native host fruits of hawthorn trees. By applying the latest tools of genome sequencing and analysis to preserved evidence from experiments carried out at Notre Dame in the 1990s, a new evolution study finds a massive genome shift in one generation. 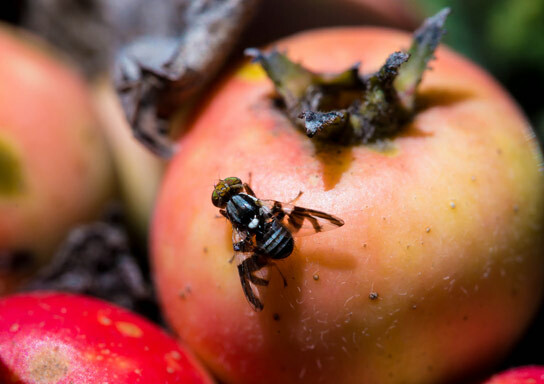 A team of biologists from Rice University, the University of Notre Dame and three other schools has discovered that an agricultural pest that began plaguing U.S. apple growers in the 1850s likely did so after undergoing extensive and genome-wide changes in a single generation. This graph depicts the genome-wide genetic differences that have evolved between a native host race of Rhagoletis pomonella that lays its eggs on hawthorn trees (red) and a new divergent host race (green) that began reproducing on apples trees in the 1850s. 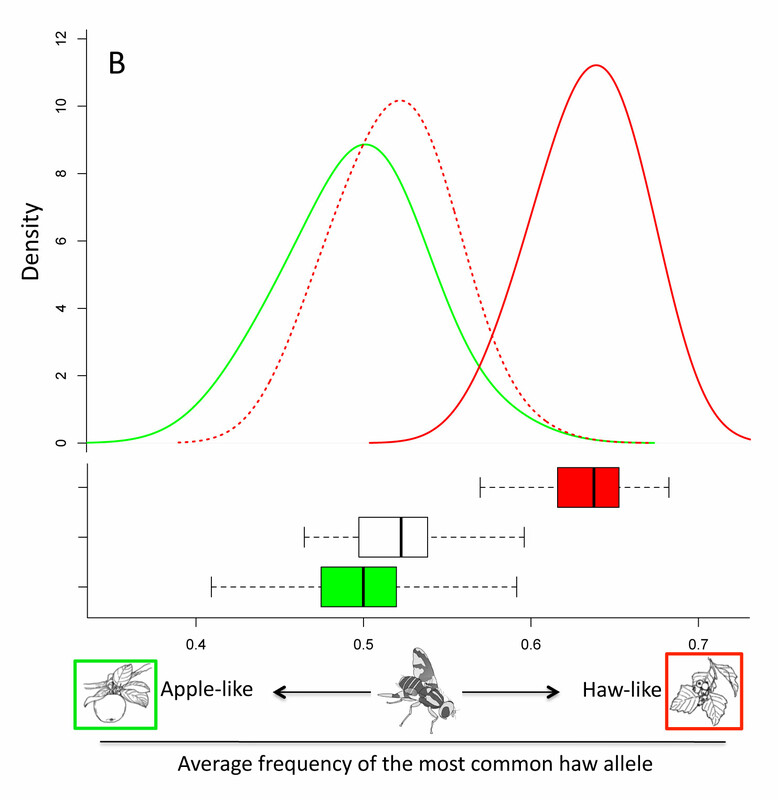 In laboratory experiments, researchers found that raising native haw flies on the apple trees’ fruiting cycle for just one generation led to a genome-wide shift (dashed red line) that accounted for up to 70 percent of the genetic differences between the two races. 1 Comment on "New Evolution Study Reveals Massive Genome Shift"
So, the gene shift was SOLELY due the arrival of the apple ala Johnny Appleseed? I dont think anyone disputes life is the ultiate predator needing only a catastrophic event to upset the established order and begin a new predation based on an adjusted geneome.